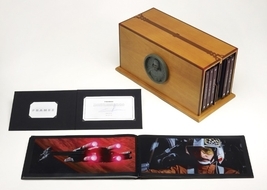 Confirming Anthony Daniels tweet, George Lucas has now announced the release of a six disc blu-ray set with a high end set of picture books accompanying the movies in an art deco inspired wooden case. This is a limited edition release and only 1,138 will be made. Anyone familiar with George Lucas’ work can appreciate that the number 1,138 was in the title of his debut film and is referenced many times in his other works. The picture book is designed to be a tribute to the films’ cinematographers, art directors, and set designers. The price point on this collection is a healthy $3,000.00 and will be available later this month.